genes, language, culture: Do they agree? death rates. . . .
"The totality of factors which determine how genes get transmitted from genertion to generation." N.B. what geneticist James V. Neel says when they're loading the boats. N.B. importance of . . .
Post-Columbian introductions: "The Yanomamó are not 'uncontacted primitive man' [sic.]." "From [the Yanomamö] viewpoint we are the people living under stress." For a look at how the Yanomamö changed in the next few years after this film was made see Ocamo is My Town (VC 1339), a film / video first released by Pennsylvania State University in 1975. For a more recent portrait see Warriors of the Amazon (VC 2667), by WGBH Educational Foundation, ca. 1996. N.B. "Only the women drink the cremated remains of the men killed in war." The Anthropology Resource Center. 1981. The Yanomami Indian Park: A Call for Action. Boston: MA. Baker, Paul. 1972. Review of 16 mm film, Yanomamö: A Multidisciplinary Study. American Anthropologist, 74:195-196. Chagnon, Napoleon A. 1967. "Yanomamö -- The Fierce People." Natural HIstory Magazine 76:1:22-31. Chagnon, Napoleon A. 1968. "The Culture Ecology of shifting (Pioneering) Cultivation among the Yanomamo Indians," Proceedings of the VIII International Congress of Anthropologica land Ethnological Sciences, 3:249-255. (Reprinted in D. Gross, ed., Peoples and Cultures of Native South America. Garden City, N.Y.: Doubleday. Chagnon, Napoleon A. 1968. Yanomamö The Fierce People. NY: Holt, Rinehart, and Winston. Chagnon, Napoleon A. 1968. "Yanomamö Social Organization and Warfare in War: The Anthropology of Armed Conflict and Aggression by Morton Fried, Marvin Harris, and Robert Murphy (eds.). NY: Natural History Press. Chagnon, Napoleon A. 1972. "Tribal Social Organization and Genetic Micro- differentiation," in The Structure of Human Populations, G. A. Harrison and A. J. Boyce, eds., Oxford: Clarendon Press, pp. 252-282. Chagnon, Napoleon A. 1967. Studying the Yanomamö. NY: Holt, Rinehart and Winston. Chagnon, Napoleon A. "The Ecology of Swidden Cultivation in the Upper Orinoco Rain Forest, Venezuela." The Geographical Review 64:4:475-495. Chagnon, Napoleon A. Noble Savages: My Life Among Two Dangerous Tribes -- the Yanomamo and the Anthropologists. Simon & Schuster, 2013. Chagnon, Napoleon A. 1973. "Yanomamo," in Primitive Worlds, Washington, D.C.: National Geographic Society, Special Publications series, pp. 141-183. Davis, Sheton H. 1976. Victims of the Miracle: Development and the Indians of Brazil. Cambridge Univ. Press. Davis, Sheton H. 1984. "Highways and the Future of the Yanomamo." In Conformity and Conflict, Ed. by James P. Spradley and David W. McCurdy, pp. 374-383. Boston: Little, Brown. Hannah, Joel M. 1972. Review of Yanomamö: A Multidisciplinary Study, American Journal of Physical Anthropology. 36: 453-454. Harris, David R. 1971. "The Ecology of Swidden Cultivation in the Upper Orinco Rain Forest, Venezuela." The Geographical Review, 61 (4) 475-495. Kensinger, Kenneth M. 1971. Review of The Feast, American Anthropologist, 73: 500-502. Lizot, Jacques. 1985. Tales of the Yanomami. Cambridge Univ. Press. MacCluer, J., J. Neel, and N. Chagnon. 1971. "Demographic Structure of a Primitive Population: A Simulation," American Journal of Physical Anthropology, 35:193-207. Neel, James V. 1970. "Lessons from a 'Primitive' People." Science, 170: 815-822. Neel, J. V., W. R. Centerwall, N. A. Chagnon, and H. L. Casey. 1970. "In a Virgin-Soil Population of South American Indians," American Journal of Epidemiology, 91:418-429. Neel, J., et al. 1971. "Studies on the Yanomama Indians," Proceedings of the Fourth International Congress of Human Genetics. Human Genetics, September 1971, pp. 96-111. Neel, James V. and Richard H. Ward. 1970. "Village and Tribal Genetic Distances among American Indians, and the Possible Implications for Human Evolution," Proceedings of the National Academy of Sciences, 65 (2):323-330. Salamone, Frank A. 1997. 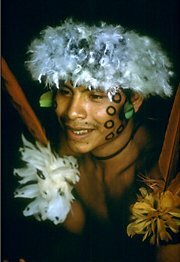 The Yanomami and their interpreters : fierce people or fierce interpreters? Lanham, Md. : University Press of America. Sharp, R. L. 1952. Seel Axes for Stone-Age Australians. Human Organization 11:17-22. Ward, Richard H. 1971. "The Genetic Structure of a Tribal Population: The Yanomama Indians. V. Comparison of a Series of Networks," Annals of Human Genetics.